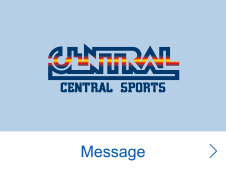 Every staff member at Central Sports is a producer who works to create well-being and a pleasant life for customers through sports. 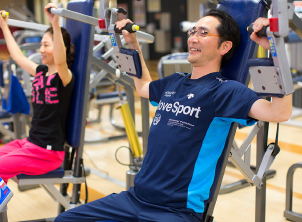 We believe that our sports clubs not only offer a place where we assist people who gather at the clubs in leading healthy lives but also provide space for the local community and serve as a base for information transmission. With the awareness that we engage in providing services that are indispensable for creating a society of good health and longevity, we will make every effort to bring excitement and smiles to customers. In order to bring excitement and smiles to customers, it is essential that we increase the quality of our services. With our corporate philosophy – “Contribute to health promotion throughout one’s life” – intact, we have set forth the “Central Sports Credo” as a code of conduct for all staff members to follow in pursuing the enhancement of service quality. Credo is a Latin word meaning “aspiration,” “creed,” and “promise.” Increasing service quality is a promise we make not only to our customers but also to all stakeholders of Central Sports. All of us at Central Sports carry our Credo with us at all times and perform duties with this promise in mind. 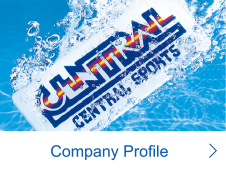 Every staff member at Central Sports is a producer who works to create well-being and a pleasant life for customers through sports. Our sports clubs provide space for the local community and serve as a base for information transmission. Being well aware that we engage in providing services that are essential in the 21st century, we greet and welcome customers with a bright, pleasant demeanor and provide them with services of the highest level. What motivates us is the smile we receive from each customer. 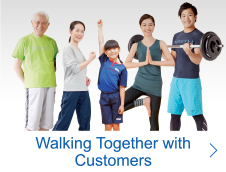 Driven by our corporate philosophy – “Contribute to health promotion throughout one’s life” – we commit to a customer-first policy. Viewing the provision of services that please customers as our number one objective, we make sure to communicate with our customers with a “smile,” “honesty” and “sincerity.” Without doing so, we cannot say that we are providing services. We welcome complaints from customers as “good advice” and “valuable information” and deal with them sincerely. We keep our sports clubs clean at all times so that customers can feel pleasant and comfortable when they are there. When we walk around our facilities, we pay attention to keeping the facilities beautiful at all times; there will not be even one piece of trash in our clubs after we make our rounds. We maintain a good understanding of information regarding our sports clubs at all times so that we can respond promptly to inquiries from customers. All members of the staff at Central Sports pay attention to their attire and personal grooming and make sure to keep themselves looking pleasant as a token of having pride in being part of the organization. With the awareness that customers are watching us at all times, we will remember to be conscious of the way we walk, our posture and figures. One staff member alone cannot carry out the work we do. All of us will always value teamwork and work together as one to provide customers with total services. Our motto when communicating over the phone is to respond “promptly, politely and kindly” and we make an effort to answer calls within three rings. We will make an effort not to keep a caller on hold but when we do need to place a caller on hold, we will make sure to ask, “Could you please wait a moment?” beforehand and say, “Thank you for waiting” afterwards. We maintain our facilities at all times to prevent accidents from occurring as we support our customers’ enjoyment of a safe sports-club life. In the event an accident or disaster arises, each staff member will confirm his or her role and calmly take appropriate action. If there is a need for an evacuation or rescue, we will place customers first. We will carry this Central Sports Credo with us at all times, and understand and carry out its underlying aspirations. In order to “contribute to health promotion throughout one’s life,” we must provide a safe environment to customers that use our facilities. At Central Sports, we not only perform daily inspections of our facilities but also have our department that specializes in facility management make the rounds for checking on a periodic basis. 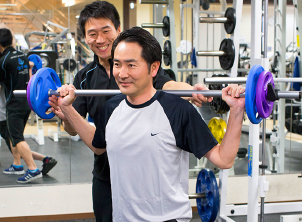 Furthermore, we perform disaster-prevention training so that we can respond appropriately should an accident or disaster arise and also hold periodic training programs on emergency procedures for the staff to ensure that we support customers’ enjoyment of a safe sports-club life. AED (Automated External Defibrillator)s are placed in all facilities of Central Sports. In addition, all of our staff members are required to acquire CPR (cardiopulmonary resuscitation) skills. Staff members regularly participate in roll-play CPR training at each of our sports clubs to ensure that they can respond appropriately should an accident occur. 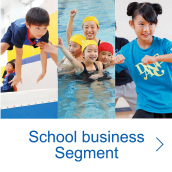 From its establishment in 1969, for more than 40 years, Central Sports has engaged in the children’s school business. 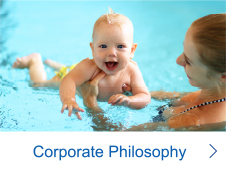 We believe that the essence of the children’s school business lies not only in coaching children on the techniques to be able to “swim freestyle,” “do a kick- over on a bar,” and so on but also in supporting their parents’ desire to “see their children grow cheerfully and in good health.” As a symbol of this desire, we established the “Central Sports Motto,” a slogan which we recite together with children before every practice session. 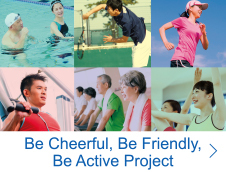 For more than 40 years, the Central Sports Motto – “Be cheerful, be friendly, be active” – has continued to be chanted in Central Sports clubs across the country. We will carry on this tradition in our school business. 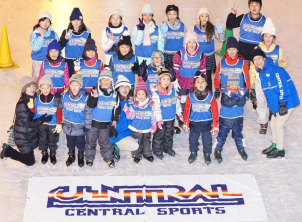 At Central Sports Kid’s School, we make ensuring the safety of children a top priority. We implement various safety management measures so that parents can have a sense of security in sending their children to our schools for coaching. As part of our safety management for children attending our Kid’s School, we have a system in place where check-in/check-out information is transmitted to parents by e-mail. To ensure the safe operation of school buses that transport children, and with the aim of enhancing security in buses, we promote the installation of a drive recorder (mounted camera) on buses. We make sure to have a lifeguard on duty at our pools who coordinates with swimming coaches in promoting the safety of children. The lifeguard keeps his/her eyes on the pool at all times, pays attention to the conditions in the pool, and periodically confirms the number of swimmers. With a view to providing children with a pleasant swimming pool environment, we work to maintain water quality. We have a 24-hour circulatory filtration system in place and also perform an hourly water quality inspection. We offer opportunities for children attending our Kid’s School to experience a variety of outdoor activities. 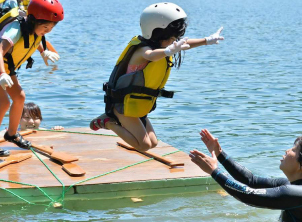 We support children’s development of mental and physical strength through various experiences, such as taking on a challenge for the first time out in nature, making new discoveries and meeting new friends. We organize various sports events to share excitement with customers. Sports not only contribute to the development of mental and physical strength but also offer the power of generating new value, such as excitement and bonding. 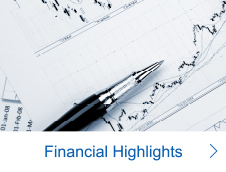 We will continue to contribute to the creation of life-time excitement by providing customers who participate in our various sports events with extraordinary time and space, encouraging customers to attain their goals, and extending our full efforts in supporting customers to take on challenges. Central Sports hosts the Hawaii Swim Camp, one of the traditional events that we have been organizing since 1974. We practice together with members of a Hawaiian swimming team with which we have had a relationship for over 40 years, participate in a local swimming competition, and experience homestay. This event contributes not only to improving children’s swimming skills but also to promoting the international exchange of junior swimmers and encouraging the formation of personal character. We fully support customers who have decided to turn their “dream” of “taking on the challenge of running a full marathon once in a lifetime” into a “goal.” On the second Sunday in December of every year, a number of exciting stories come to life in Honolulu. In January 1986, we established the Diving Association of Central Sports (DACS), a scuba diving instructors’ organization. 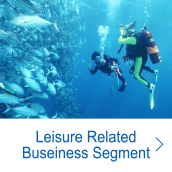 We lead customers to the world of the ocean, away from regular everyday life. To date, we have issued a C-card (license) to over 40,000 participants. During “Central Masters,” a swimming competition held twice a year, a number of master swimmers gather together and compete in a heated race. Central Sports’ instructors across the country are extending full support to all swimmers who aim at setting their personal best records. The concept of “health management” – recognizing the fitness of employees as a management resource and actively taking initiatives to manage the health of employees – is becoming widely recognized. 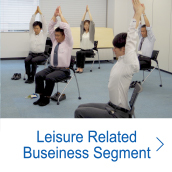 By creating a workplace in which employees work actively with enthusiasm, both mentally and physically, to increase the efficiency of management and enhance productivity, companies are expected to build a structure for supporting employees on a total basis in terms of “exercise, nutrition and rest.” Central Sports actively supports enterprises that promote health management, by leveraging its know-how with respect to exercise instruction and corporate support fostered to date. 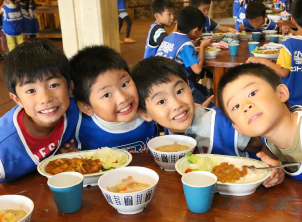 Under the Sport Basic Plan formulated by the Japan Sports Agency in an aim to realize “Sports for All of Society in Japan,” the country has set forth a target of increasing the percentage of adults that engage in a sport at least once a week to approximately 65%. Looking at this data by generation, it is said that the percentage of adults in their 20’s to 40’s, i.e., the active working generation, who engage in a sport at least once a week tends to be low. 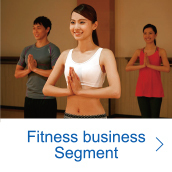 By providing health management support to companies, Central Sports will contribute to health promotion and to the creation of a vibrant society backed by the regular exercise habits of the acting working generation. As we enter an ultra-aging society and the rate of aging of society heightens, there are concerns about the fiscal impact caused by the expansion of social security benefit payments and the stagnancy of economic activities associated with a decline in the work force among others. 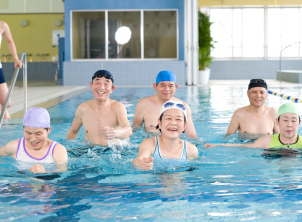 Maintaining and enhancing the fitness of the senior generation is an important measure for promoting the resolution of such social issues. 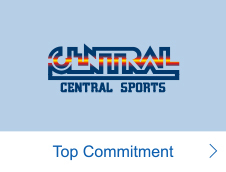 Central Sports has solid expertise on guiding health promotion that it cultivated as a pioneer in the fitness and sports industry. 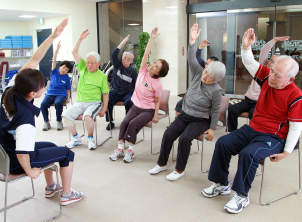 With this know- how as a base, we are actively engaged in the development and provision of exercise programs in which even elderly persons can participate comfortably, as well as in the operation of our care prevention business. 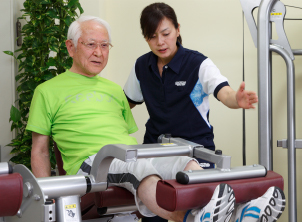 The services desired by people of the senior generation in this ultra-aging society are diverse. 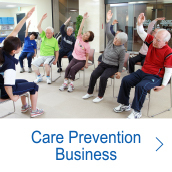 At Central Sports, while we work to offer solutions to social issues, such as maintaining and promoting the health of people of the senior generation, we also focus on the care prevention business, which targets not only people who are members of our sports clubs but also people who have health concerns and those who have difficulties visiting a sports club.